TUCSON, ARIZ. – Seattle Sounders FC wrapped up its preseason action in Tucson in a 2-1 loss to Mexican side Celaya FC on Tuesday evening at Kino Sports Complex. Forward Nelson Valdez tallied his first goal of the preseason in the second half, but the Rave Green couldn’t overcome two early scores from Celaya. Sounders FC resumes its 2016 preseason presented by adidas this weekend when the club travels to Mt. San Antonio College for a week of training from February 13-18, as well as a pair of friendlies before starting the 2016 campaign on Tuesday, February 23 against Club America in the first leg of the 2015-2016 Scotiabank CONCACAF Champions League Quarterfinal Round at CenturyLink Field. Celaya FC jumped out to an early lead on a goal from Cristian Gordillo in the third minute. After a Celaya throw-in put the ball into the area, Gordillo received a pass, took one touch to position himself before sending the ball to the far post past a diving Stefan Frei. The Ascenso MX side extended its lead to 2-0 in the 16th minute on goal from Victor Mañón on a long-range effort after the ball was placed into empty space just outside the area. On the approach, Mañón delivered a one-touch strike to the upper left corner of the net. 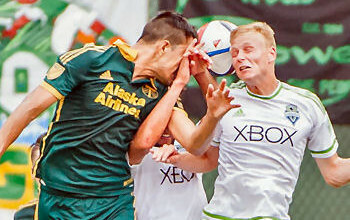 Sounders FC pulled one back early in the second half on a goal from Valdez in the 54th minute. Set piece specialist Andreas Ivanschitz provided the service from just outside the area on the left side, where a surging Valdez crashed the box and directed a well-placed header inside the right post. 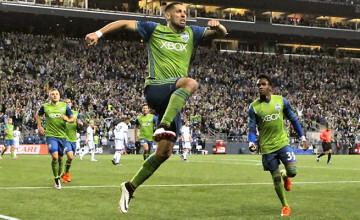 Sounders FC once again came out in a 4-3-3 formation, this time with second-year Homegrown Player Darwin Jones placed alongside Designated Players Clint Dempsey and Valdez to head the attack above midfielders Osvaldo Alonso, Erik Friberg and Andreas Ivanschitz. Jordan Morris made his first match appearance for the Rave Green when he came on for Jones at the half. The remainder of the Seattle starters came off later in the second half, with Oalex Anderson and Andy Craven joining Morris at forward in front of Cristian Roldan, Zach Mathers and Emir Alihodzic in the midfield. Charlie Lyon replaced Stefan Frei in the 76th minute along with a new backline of Michael Nelson, Zach Scott, Damion Lowe and Dylan Remick. The 2016 Sounders FC preseason presented by adidas continues this weekend when the club travels to Mt. San Antonio College for a week of training and a pair of friendlies. Complete information on the 2016 Sounders FC preseason presented by adidas can be found at SoundersFC.com/SFCpreseason. Seattle’s eighth season begins this month with the 2015-2016 Scotiabank CONCACAF Champions League Quarterfinal Round against Club America before the MLS season-opener on March 6. 2016 Sounders FC Season Ticket Packages are available now for as low as $24 per match via the following link: http://sndrs.com/uxb7 or by calling 1-877-MLS-GOAL. Post-match soundbytes from Sounders FC Head Coach Sigi Schmid, forward Jordan Morris and defender Jimmy Ockford are available for download via the following link: http://sndrs.com/366p.